As one of the biggest cities on the planet, New York City is simply filled with things to do. Millions upon millions of tourists and visitors flock to the Big Apple each and every year to see world famous monuments like the State of Liberty or Empire State Building, and the city also hosts countless live shows and entertainment including concerts, sporting events, theater productions, comedy shows, and more. New York City is home to multiple great roller skating rinks, so you won’t need to worry about traveling too far to enjoy some fun roller skating action in the City That Never Sleeps. Check out the following rinks for your next roller skating sessions. The LeFrak Center at Lakeside offers all sorts of activities including cycling, boat rentals, yoga, ice skating, and, of course, roller skating too. This location welcomes people of all ages and backgrounds, both alone and in groups. Roller skating runs from April through to October, with the roller skating rink being transformed into an ice skating rink for the colder months of the year. Pop music plays in the background as you and your friends or family skate around at this beautiful location. Admission is very reasonably price and the rink is usually open from the mornings through to the early evening, with birthday and private parties also available after hours with reservations. For roller skating on Staten Island, check out Rollerjam USA. With fun laser and light effects, as well as a vibrant soundtrack each and every night, Rollerjam USA provides a superb environment for unforgettable roller skating action for you and your pals. Catering to both kids and adults, this NYC roller skating rink offers bounce parties, arcade games, private events, school outings, scout reunions, and even doubles up as a nightclub for adults-only evenings throughout the weekend. In short, if you’re looking for a good roller skating time in NYC, this is a super place to be. 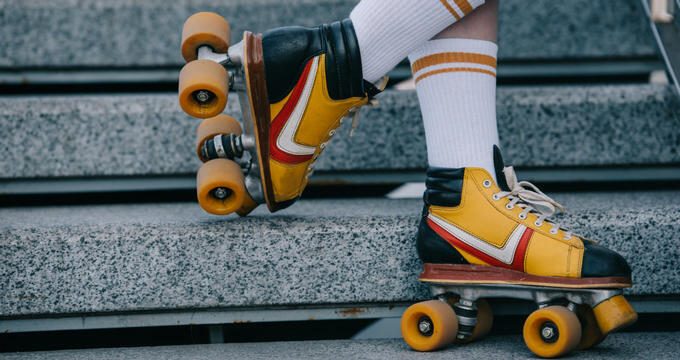 Bringing the spirit of the 70s in the 21st century, Hot Skates is one of the most fun roller skating rinks in the entire New York City area. Open both day and night, this rink runs all kinds of services and special events to cater to any kind of roller skating fan. All ages public skating sessions are held several days per week, with birthday and private parties also available too. Once a week, adults-only roller skating sessions will also be held and a 'Roller Hockey' season also runs at this location, offering an exciting way for people aged 17 and above to try out a new sport and test their skills against other teams. Riverbank State Park is a great place to spend a day. Not only is it a pretty place to simply walk around on a sunny day, it also offers all kinds of fun activities. This park houses an Olympic sized swimming pool, a covered skating rink, an athletic complex, a huge restaurant, and a cultural theater. It's a real hotspot for the local community and a great place to come with friends or family. The skating rink is used for ice skating through the colder periods of the year but is open for roller skating through the spring and summer months. Public skating sessions are held several times per week, including on holidays, with adults-only nights running twice a week too. It's really cheap to skate on this rink and open roller hockey sessions and tryouts are held often too. Birthday parties and private group roller skating sessions can also be enjoyed at this location on request.